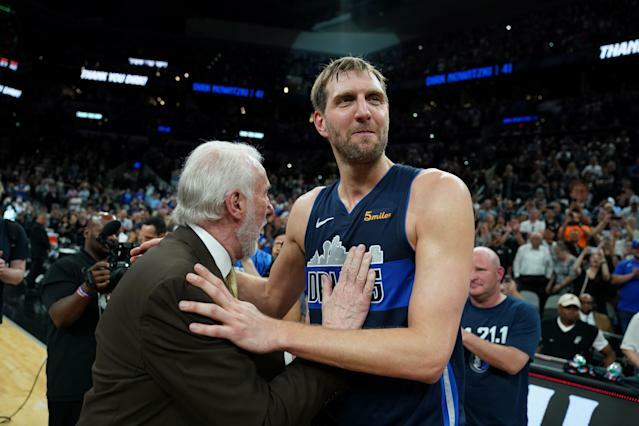 Dirk Nowitzki has been retired for just a week now, but the former 40-year-old Dallas Mavericks star is already letting himself think about the future. Nowitzki as a coach is an interesting thought. Not only is he a player who came to the U.S. from Europe (Germany specifically), he played for one team his entire career. His experience is different than many other NBA players, but being with Dallas for so long allowed him to see many different kinds of players come to the Mavericks. He has an interesting perspective on the game and wants to help guide players, and while that alone doesn’t always mean someone will be a good coach, it’s certainly part of it. But it doesn’t sound like he’s ready yet to jump into the next phase of his post-playing career. Nowitzki has been indulging a little now that his playing days are behind him. Wine and cake?! Dirk, you bad boy! Kidding, of course. Retirement means getting to do things that the rigors of NBA life made impossible. For Nowitzki, that means having some booze and some baked goods. Plus, wine and cake with Dirk Nowitzki sounds like it would be a high quality evening. Enjoy your wine and cake, Dirk Nowitzki. After 21 seasons, you’ve earned it.